In Canada, the theatre production ‘The Trial of David Suzuki’ became a sold out event which intrigued an audience of all ages. To the Canadian scientist, broadcaster and author David Suzuki, it provided a way to discuss the threat of human-induced climate change without first having to “prove” it is happening. Dr David Suzuki has won numerous awards and is world-famous for being an advocate for both humanity and the environment. 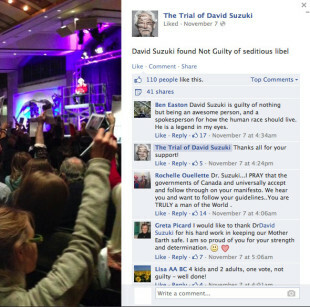 On 6 November 2013, he staged an unusual and dramatic theatre production in Toronto: ‘The Trial of David Suzuki’ – a mock trial, held at the Royal Ontario Museum. He stood accused of seditious libel – spreading lies against the government – and the show was promoted as if it had been a real trial where Suzuki would have to defend his ‘Carbon Manifesto’ which had been published as an nine-minute video on youtube.com a month earlier. “The Carbon Manifesto, in which he claims that climate change is a matter too urgent to keep delaying significant action, states that we need to work as a nation to end the exploration and production of oil by 2035 and begin to change the way we live now as the future of our youth and their children depend on it. 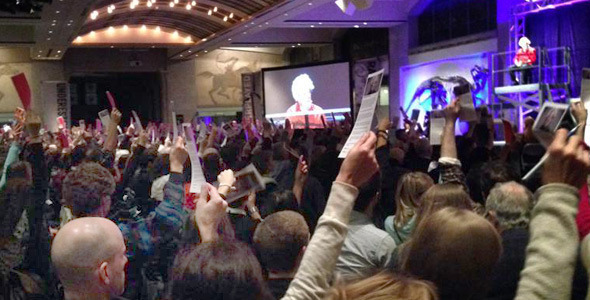 Created and produced by Laurie Brown – an advocate for the arts and a Canadian radio personality – ‘The Trial of David Suzuki’ argued and gathered public opinion on whether or not Dr. Suzuki’s Manifesto is a plan that will save the world or destroy the Canadian economy as we know it. The cast of the trial included actual lawyers (Linda Rothstein and Will McDowell), a judge, a jury, government of Canada Officials, artists and scientists, expert witnesses (business professor Michael Hlinka and Environmental Minister of Ontario Gord Miller) and of course, Dr. David Suzuki himself with Laurie Brown acting as the bailiff. “The mock trial provided a way to discuss the threat of human-induced climate change without first having to “prove” it is happening. The latest IPCC report provided the scientific heft and sense of urgency. I didn’t know what to expect of the audience’s final decision but was gratified with the result, of course. I hope we can conclude that the audience navigated through the arguments and claims to conclude that these were valid concerns and solutions. I have to repeat a bit of what I said last night. In 1988, an international meeting of climatologists was held in Toronto where the scientists were so concerned with the threat of global warming that they issued a call for a 20% reduction in greenhouse gases in 15 years. Had we heeded that call which at that time was very achievable, we would have been well on our way to a path of sustainable energy. But in order to get U.S. President George HW Bush to attend the Earth Summit in Rio in 1992, a much watered down target of stabilization of 1990 levels of emission by 2000 was signed, but then ignored. In 1997, in Kyoto, delegates proposed a target of 5–6% reduction below 1990 levels by 2010. Canada ratified the Kyoto treaty in 2001 but did little to achieve the reduction and the current government withdrew from the treaty altogether as our emissions continued to rise. Unlike the prosecutor’s claims last night, there are countries that are taking strong steps to reduce greenhouse gas emissions. The carbon manifesto was based on the need to move to non-carbon energy much faster. Video trailer for ‘The Trial of David Suzuki’. 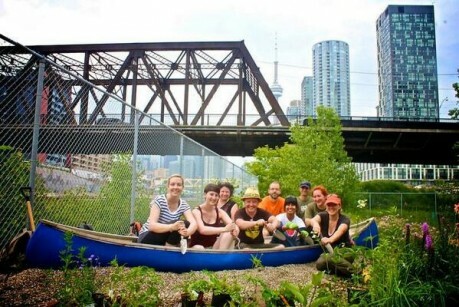 The Trial of David Suzuki: Act 1. On 9 October 2013, David Suzuki unveiled his ‘Carbon Manifesto’ on the steps of Toronto’s Courthouse. Collision of science and art. 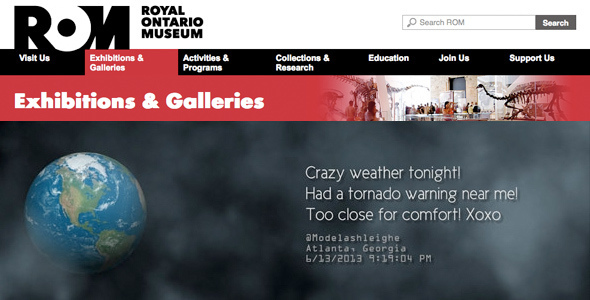 On 19 October 2013, Toronto’s Royal Ontario Museum, one of the largest museums in North America, opened ‘Carbon 14’ — an art exhibition and four-month programme of theatre plays, talks and seminars about climate change. Collaborating with scientists and cultural informers in confronting the facts of global climate change, the artists participating in the ‘Carbon 14: Climate is Culture’ exhibition respond to various aspects of the climate challenge in poignant, nuanced, subversive, often humorous, and always passionately human ways. 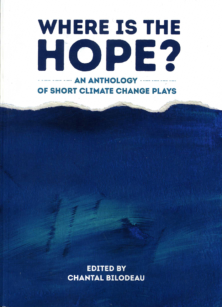 Subjects include explorations of a changing Arctic, the health of oceans, biodiversity and extinction, sustainability and new, clean technologies; and central questions of politics, economics, and ethics. Imaginative, experimental and eclectic in its approach, ROM Contemporary Culture explores new ideas and new technologies to raise provocative questions about the natural world, living cultures and the creative mind. This season ROM Contemporary Culture explores the issue of environment and climate change asking: how does landscape change a culture and how does culture change a landscape? 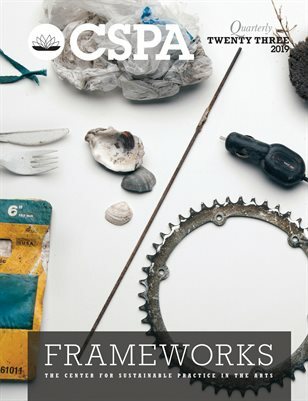 Curated by David Buckland and Claire Sykes, and produced by Cape Farewell in partnership withROM Contemporary Culture, ‘Carbon 14: Climate is Culture’ explores the growing global issue of climate change through the eyes of scientists, artists and cultural informers. Art and science come together like never before in this engaging and provocative exhibition, two years in the making. The exhibition features 13 art installations. » Experience the collision of science and art with the Carbon 14: Climate is Culture exhibition at the Royal Ontario Museum in Canada. In addition to the Carbon 14: Climate is Culture exhibition, Cape Farewell have developed a rich series of public programs, satellite projects and events that are set to unfold throughout the four-month exhibition run. ‘Climate is Culture’ will be four months of cultural engagement visioning the challenge and the possible future, a unique and powerful narrative engagement with what is one of the most pressing issues of our time, climate change. • A performance series produced in partnership with Toronto’s The Theatre Centre, featuring the world premiere of Sea Sick – performed by Alanna Mitchell and adapted from her award-winning book; the Canadian premier of Cynthia Hopkins‘ multi-media musical performance piece This Clement World; and special musical performances. 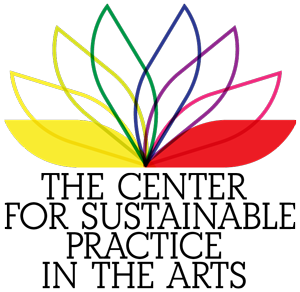 The series runs January 26 – February 9, 2014 at The Theatre Centre, Toronto. • Public screen-based art projects in partnership with Pattison Onestop, as part of their Art in Transit program, set to unfold on the Toronto Transit System (TTC) subway platform screens, on the Pattison Onestop network of shopping centre screens nation-wide, and on various digital billboards in the city. The first installment of art work in November 2012, featured Ship of Fools: Artist and Climate Change, with work by James Balog, Heather O’Neill, and Shad. • Public lectures, talks and discussions, including the Carbon 14 Dialogues on topics ranging from the changing Arctic landscape, to the theme “climate is culture” developed in partnership with ROM and the Munk-Gordon Arctic Security Program. • Satellite exhibition and related programming focused on water at THEMUSEUM in Kitchener, Ontario, featuring work by Eamon Mac Mahon in conjunction with Surface Tension: The Future of Water. This exhibition runs September 20, 2013 through January 5, 2014. Imagine a time when we might find our most trusted and respected scientists tried in a court of law for speaking out against environmental practices. We’re not there yet, but the “Trial” does take the views about climate change of one well-known and controversial scientist, and give his supporters, and those that disagree with him, equal time to challenge each others ideas about our changing environment and how the way we live impacts it. ‘The Trial of David Suzuki’ — a powerful live theatre and public engagement project conceived and produced by Laurie Brown, is presented by Cape Farewell in partnership with Donnelly Law and ROM Contemporary Culture as part of the Carbon 14: Climate is Culture exhibition. 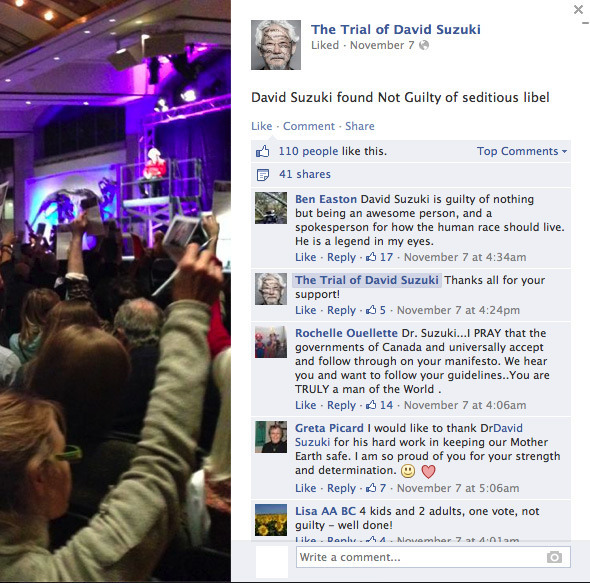 » Click here to book tickets or for more information on ‘The Trial of David Suzuki’.